At 9½ ft. wide, 75½ Bedford St is the narrowest house in the city. On the inside, it measures 8 ft. 7 in. wide; at its narrowest, it’s 2 ft. wide. From the facade to the rear garden the house is a cozy 30 ft. deep. This picturesque three-story red-brick structure owns a history a lot wider than its walls, though. It was built in 1873 during a small pox epidemic, for Horatio Homez, trustee of the Hettie Hendricks-Gomez Estate, on what was a former carriage entranceway, with stables to the rear, between 75 and 77 Bedford Street. However, the assessed value of the plot of land did not change, suggesting that it’s possible the house had built prior to that, but never recorded. It originally served as a cobbler’s shop, and then a candy factory (and home to candy marker Martha Banta in 1880). Thomas Newett, a shopper, lived here in the 1890’s. By the 1920's, the neighborhood became largely working class Italian and Victor Ponchoine, an immigrant vineyard cooper, resided here wit his family. In 1923, as the Village was reinvented as an artist enclave, Spalding Hall and fellow artists and actors leased 73-77 Bedford Street, converted them into apartments and established the Cherry Lane Theatre around the corner. Shortly thereafter the openly bisexual poet Edna St. Vincent Millay and her new husband, Eugen Jan Boissevain, a coffee importer, took up residence at 75 1/2 Bedford. They hired Ferdinand Savignano to renovate the house. He put in a skylight and transformed the top floor into a studio, installed casement windows at each level and topped the front with a tiny Dutch stepped gable, most likely to reflect Boissevain’s Dutch heritage. Before that the house had a typical Italianate look common to the 1850s. 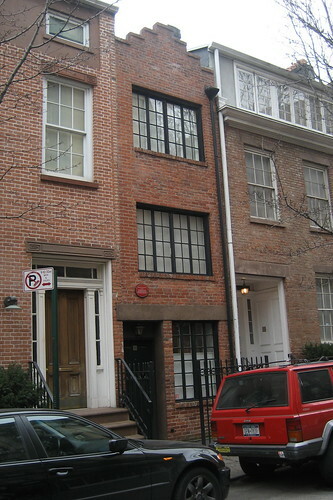 According to the plaque on the front of the building, Millay lived there from 1923-1924 and wrote “The Ballad of the Harp-Weaver,” for which she won the Pulitzer Prize. Elizabeth Barnett, literary executor of the Millay Society contests this, saying she wrote the poem while still living in Europe. Writer Ann McGovern (who lived herein the late 1980s) asserted in a newspaper interview that Millay wrote part of “The King’s Henchmen” there. A centrally placed spiral staircase dominates all three floors and bisects the space into two distinct living areas. The narrow steps call for expert sideways navigational skills. Under the stairwell on the first floor is a tiny utility closet, the only closed storage space in the house. All three floors have fireplaces. An overloaded metal coat rack is next to the two-seater sofa in the front parlor. In the rear kitchen, there is a wooden counter with a compact sink, some stools, four mini burners lined up flush against a wall, a refrigerator and cupboards. The kitchen enjoys abundant natural sunlight that radiates through a wall of windows. A Dutch door gives access to a leafy garden. To the right is an arched black iron gate, which exits onto Commerce St. Both the second- and third-floor rear rooms (office and bedroom, respectively) feature glass and wooden doors that open wide onto a sturdy U-shaped iron balcony that overlooks the garden. The third-floor front constitutes the storage area: one wall of shelves and a hanging bar along another wall. In the kitchen a heavy trapdoor is propped open to reveal a steep staircase that leads down to the basement boiler/laundry room at the back and a recording studio and a small bed at the front. A dollhouse-sized kitchenette and a bathroom are nestled between the two mini spaces.